A team play variant is also included, in which one team member tries to hold the cards while their partner adds cards to their hand. The first team to complete their palm tree wins. 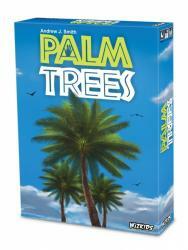 Palm Trees comes with 78 frond cards and 6 “tattoo sleeves,” patterned to look like tree trunks, for players to wear on their arm. The game was created by Andrew J. Smith, and is intended for 2 to 6 players, ages 10 and up. Playing time is about 20 minutes.